Allison DuBois: I can't be wrong! Manuel Devalos: Sure, you can. You're a human being. The ability to be wrong is one of the membership requirements. And the willingness to admit it, that gets you extra points. I rarely fall in line with network television programming�and it certainly isn't out of some highbrow snobbery because if anything I'm a card-carrying Mr. Lowbrow�just for the simple reason that the content rarely gets to go outside the proverbial envelope that film and premium cable can dig into. As a rule it has to work within the confines of a fixed runtime that is predestined to be broken up by momentum-killing advertising, as well as operating under ever-increasing layers of conservative knee-jerk censorship designed to castrate most material, rendering it into bland, tasteless mush. That's my opinion, anyway, and I'm sticking to it. And it factored in to my willingness to jump on board with Medium. When it comes to the trend of crimestoppers with a little extra "vision", I tend to prefer the craggy, apocalyptical darkness of Millennium's Frank Black any day of the week over any of the prettier throne pretenders that have come after. The 2005 mid-season CBS entry cast Patricia Arquette in Medium, a series that is based in part on the real-life exploits of author/medium/profiler-of-sorts Allison DuBois, and represented here by a five-disc/16 episode collection of Season One. The likeable Arquette plays DuBois, a young married woman in Phoenix struggling with creepy visions of very bad things, and wrestling with the problem of what exactly to do with that gift. After a pilot ep involving DuBois aiding the Texas Rangers and Arliss Howard's Captain Push (who thankfully returns for the season's cliffhanger When Push Comes to Shove), our pretty visionary settles in working occasionally for kindly but skeptical District Attorney Manuel Devalos (Miguel Sandoval) on difficult cases. Glenn Gordon Caron (Moonlighting) created this series, and much like the winning ingredient of that Bruce Willis/Cybil Shepherd series, the strength of this show isn't really on the crime-of-the-week elements, but rather on the banter and tribulations of the daily personal life of the main character. 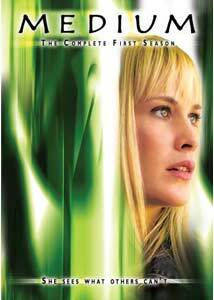 Arquette does a quietly magnetic job as a woman who sometimes doubts herself and her mysterious abilities, as she tries to find a balance between her visions and her home life. It's hardly an overdone performance by any stretch, and it comes across with the right kind of low-key drama and intensity that Arquette makes look very natural. Jake Weber plays Allison's husband Joe, a casually laid back and supportive guy (no loud wisecracks or male-pattern-stupidity here), and if you sprinkle in a couple of cute-but-believably-normal young kids then the mix is right for a bit of relatable domestic turmoil accented by the creepier aspects of Allison's bad dreams and general extra sensory talents. For me, it's the day-to-day home front material that's the best part of the series, and the forced suspense of most of the crime solving subplots just seemed to get in the way of all that. As network television goes, I suppose this series tries its best to deviate from being too broadly predictable, though each ep begins with a dream sequence that the viewer aren't necessarily supposed to know is a dream sequence. That's the familiarity gimmick that the show relies on, and as the relatively short, 16-episode season plays out the impact of this diminishes a bit, especially when watching back-to-back via a season set. The resolutions don't always end with a big bang�Suspicions and Certainties has Allison seeing a different man in her visions than the one the police have in custody�and that is pleasantly different, and certain eps�the Little Red Riding Hood parallels of Night of the Wolf, in particular�take on a more surreal and cinematic feel than others. I'm not as wholly enamored of Medium as the hype led me to hope, though Arquette's Emmy-winning performance as Allison DuBois is certainly the show's strong suit. The psychic/vision/dream angle is a rich premise and the execution comes close more often than not, but I'm as surprised as anyone that I found myself preferring the stuff that went on at home more than the crime-of-the-week stories. Image Transfer Review: Overall a very nice job from Paramount here, with all eps presented in 1.78:1 anamorphic widescreen. Colors are deep and vibrant throughout, sporting warm, natural fleshtones and a solid level of detail even during night scenes. No evidence of specking or dirt, with each ep looking clean and debris-free. Audio Transfer Review: All sixteen episodes are presented with Dolby Digital 5.1 surround, though the alternate extended version of the Pilot ep is only available in 2.0 surround. The 5.1 mix is pleasant sounding and modestly effective when the mood calls for suspense, coming to life through the rears largely through score elements. Voice quality is crisp and well-defined, with moderate directional movement. A Spanish 2.0 track is also available. Extras Review: Packaging for this five-disc set is a slipcase around three Nexpak-like cases. Cover art for the cases each have episode summaries, but does not include original airdates. It is, however, noted that the eps are presented here in order of original airdate. Disc 1 carries the Pilot ep in two flavors, the Network (45m:01s) and the Extended (49m:52s) versions. At just under five minutes, the differences are negligible, and the extended version is available in 2.0 surround only. Fifteen rather brief deleted scenes are also available sporadically (some eps have none, some have two, three or more), with the shortest being :21s and the longest 02m:18s, with most running under one minute. The scenes are all presented in nonanamorphic widescreen. There are four Patricia Arquette-less commentary tracks spread across four episodes, two of which feature creator Glenn Gordon Caron; he's paired with producer Moira Kirkland on Coming Soon and executive producer Rene Eschevarria on In the Rough. Cinematographer Ken Kelsch and production designer Jessica Kender handle the chores on I Married a Mind Reader while Being Mrs. O'Leary's Cow offers up guest star Chad Lowe and executive producer Ronald L. Schwary. The Kelsch/Kender track probably delivers the most unique perspective, with much of the other content covered in some of the featurettes. Disc 5 carries four featurettes, a gag reel (06m:48s) and a trio of television spots. The four shorts are a mixture of show development and origins, discussion of the real Allison DuBois and one dedicated to the talents of Patricia Arquette. The self-explanatory segments are entitled The Making of Medium (23m:49s), The Story of Medium (26m:19s), Interpreting Allison DuBois (09m:22s) and, as promised, The Real Allison DuBois (14m:26s). Each episode is cut into six chapters, with optional English subtitles. I really like the characters quite a bit�especially the elements where our tormented heroine is dealing with family life�but some of the show's crime-of-the-week storytelling machinations just seemed too neatly packaged for my tastes. Existing fans of the show will likely appreciate the presentation and extras here, but I'd suggest a rental first for all others just to see if this floats your network television psychic boat.